As part of continuing cooperation between Commissariat à l’Energie Atomique et aux Energies Alternatives (CEA) and the UK’s National Nuclear Laboratory (NNL) a group of future leaders from CEA who are part of a high profile programme called the Cycle de Formation Supérieure (CFS), visited NNL in Cumbria last week. The cooperation stems from a 2012 agreement signed by the UK and French Governments on cooperation in the area of research and development which has lead to the development of common research programmes. The CFS programme was created by CEA in 1987 and aims to prepare future decision-makers to be effective in their future executive positions. They follow a 5-week programme, with 4 weeks at CEA facilities in France and one week abroad. This overseas week is to broaden the group’s vision of international research, to enable an understanding in cultural differences and methods leading to a more effective approach to international collaborations. This year the UK was selected for the final week, due to its current renaissance in nuclear. 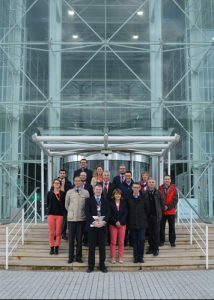 In particular CEA wanted to visit NNL due to its role as both the UK’s Government’s and Industry’s national laboratory. Charles Potter, Director for Reactor Operations Support led the visit to NNL’s Central and Windscale Laboratories in Cumbria and said, “It takes a considerable team effort to accommodate visits like this and I’d like to thank everyone who helped make this visit a success. Throughout the tour there were many questions asked about collaborative work. We’ve also had some great feedback from the French Embassy in London that the visit was interesting and thought-provoking particularly when the group realised that although NNL is Government owned, it operates on a fully commercial model with no direct funding from Government. They were also keen to understand how we prioritised our earnings to reinvest in customer and internal research and development. We will continue to build on our relations with CEA through our steering group, co-chaired by Fiona Rayment and Andrew Sherry. We now have the opportunity to build on key areas of R&D collaboration and also work towards a reciprocal visit to the French facilities in the near future”.